All of us have certain areas of our bodies that we are not confident of. There's so much of myself that I feel can be worked on! Having seen so many reviews of Halley Medical Aesthetics online, I decided to head down for a consultation to speak with Dr Terence Tan. 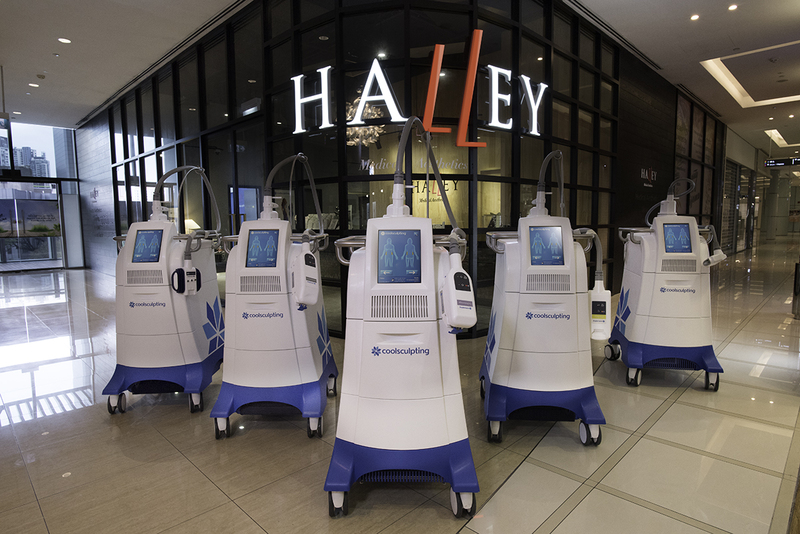 Halley Medical Aesthetics is located conveniently in the heart of town, Orchard Gateway, so it is convenient. It is just opposite the National Library on the 3rd floor. I love the interior of the clinic, which has this very cosy and welcoming vibe despite it being huge and spacious. Certain corners of the clinic are super insta-worthy as well! Wished I had taken more pictures during the time I was there. Honestly, I thought I would be a little awkward having to bare my body to Dr Terence Tan and the therapists. *cries* Imagine baring your body to people whom you don't know and pointing out all your flaws for them to see. Thank God everyone there made me feel so much at ease! Ever since I gave birth to Aaryanna, I have been especially concerned with my tummy and thighs. Despite watching my diet and working out, I still have problems losing the fat in those stubborn areas. Knowing my concern, Dr Terence Tan recommended me to try out cryolipolysis, a fat freezing treatment called CoolSculpting. CoolSculpting is a non-invasive treatment that helps to target spot reduction of body fat and permanently remove them from areas where even spot toning exercises will not be able to remove. This treatment freeze the adipose tissue (body fat) in a non-invasive manner, resulting in the break down of fat cells. The fat cells in the treated area die naturally and are pass out of the body eventually. CoolSculpting can be used to get rid of the stubborn fat on your double chin, abdomen, love handles, buttocks, inner and outer thighs, back or bra fat area, and even your arms. Dr. Terence Tan recommended the CoolSmooth Pro for my outer thighs and the CoolFit Advantage applicator for my inner thighs. These applicators are designed to cover a greater area and hug our thighs better. 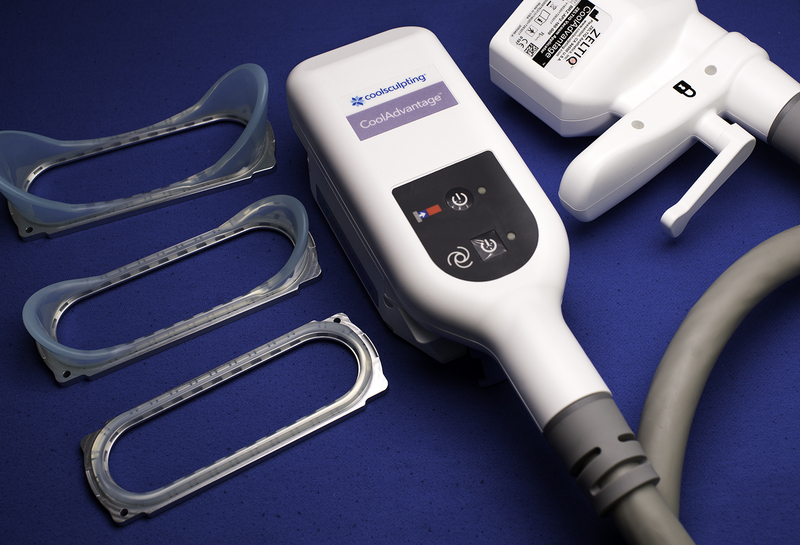 CoolAdvantage is the latest applicator to the CoolSculpting family. The new CoolAdvantage applicators are not only bigger with a bigger cooling area to increase direct contact with tissue, it is also more comfortable. Treatment time is also reduced by nearly half from 1 hour to 35 minutes. 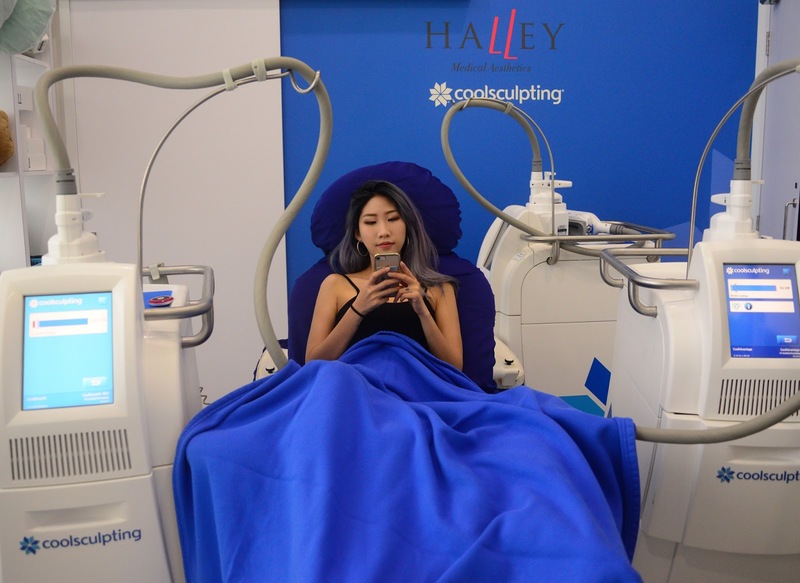 Halley Medical Aesthetics has more than one CoolSculpting machines in the clinic, hence I was able to do two areas at one time rather than have it done over four sessions. This saved a lot of my time; less time spent on fat reduction means more time with my daughter! I am so excited to get started on my journey with Halley Medical Aesthetics after hearing all the pros on the treatment. After my consultation with Dr. Terence Tan, we moved to the treatment room where he will first mark out the troubled areas that needs to be treated. I was then ushered to a big comfortable chair where treatment will take place. A cooling gel pad was then placed on the marked area on my outer thigh to protect my skin during treatment. After placing the CoolSmooth Pro applicator on my right outer thigh, Dr. Terence Tan and his therapist wrapped a soft velcro strap around it to ensure that the applicator is in good contact with the skin and that it is secured tightly for maximum suction. After securing the CoolSmooth Pro applicator, they then applied the CoolFit Advantage applicator on my left inner thigh. At the start of the CoolSmooth Pro cycle, you will feel a cooling sensation on your skin followed by numbness. But as the CoolFit Advantage applicators works on suction, you will feel a gentle tugging of your skin into the applicator before the cooling begins. So here I am, being treated by two CoolSculpting machines at one go -- this is DualSculpting at work! While waiting for CoolSculpting to work its magic on me, I was comfortably playing with my phone throughout. Once the two machines were done, they proceed to treat my left outer thigh and right inner thigh. After each treatment cycle (one cycle for each outer and inner thigh), the therapist would massage the treated area to help break down the crystalised fat cell.